New Year’s Eve has its own name and personality here in Berlin. The holiday isn’t known as New Year’s Eve here; it’s called Silvester. Named for a pope from the 4th century AD, the odd name persists, though the celebration is as pagan as anything you might dream up. Daytime activities include fortune-telling games and a viewing of a 1963 British comedy sketch called Dinner for One, and thanks to a package from a German intern we’d hosted, we were introduced to both at once. First we played Bleigießen, which translates to lead pouring, and that’s exactly what you do. 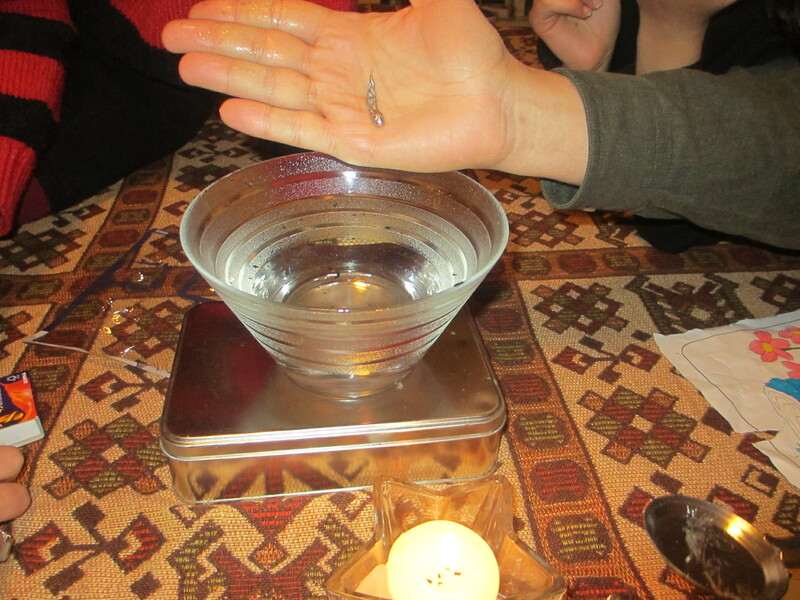 You melt small lead forms in a spoon over a candle and pour the melted metal into cold water. The lead quickly hardens into a shape; the group decides what it looks like and the pourer decides what meaning it sheds on the New Year. Apparently this game dates back to Roman times. Mine came out looking like a bird, which is supposed to mean “good luck coming.” My family members were not as taken as I was by this game, and found the resulting shapes all too similar for their taste. These phrases rang a bell for me as a rower had told me months ago that all Germans know them, even if they don’t speak English. At the time I had no idea what she was talking about. 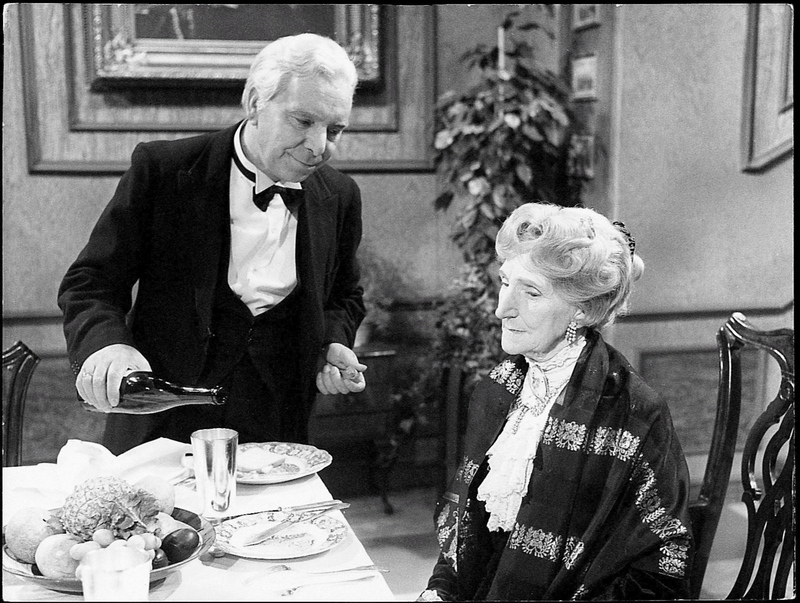 As it turns out, the show aired randomly on German television on Silvester in 1972 and was so overwhelmingly popular at the time that the tradition of airing and watching it at the New Year continues to this day, and it is firmly a part of German culture. Who knew? But our daytime activities were increasingly punctuated by the pops and booms of fireworks being set off on our block, neighborhood, and across the city. 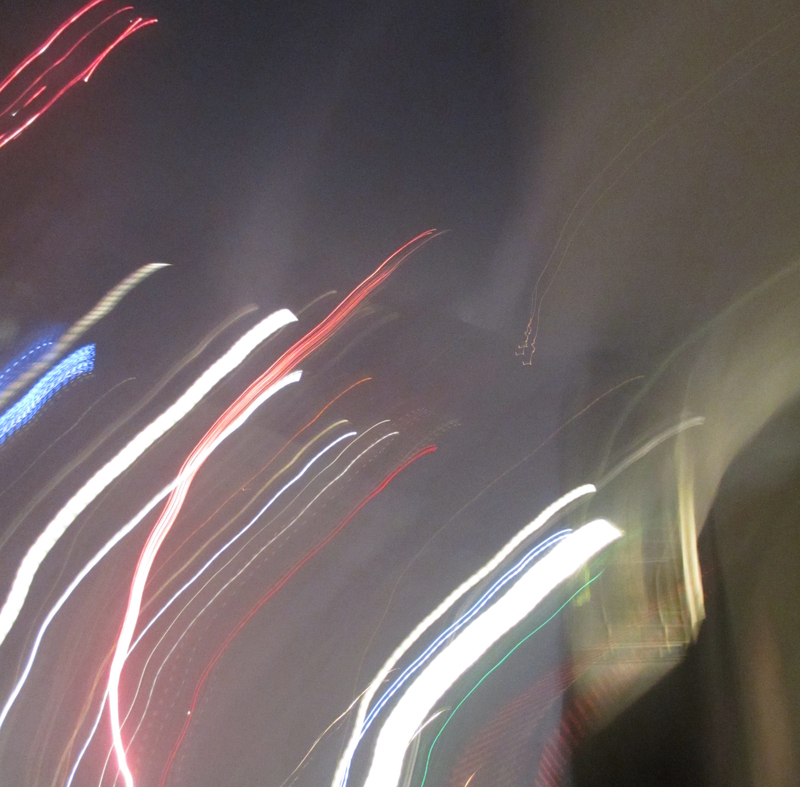 Berliners use Silvester as an excuse to get very, very loud. There were few of the little sparkly kind you see in Minnesota alleys on the 4th of July. We’re talking M80s and cherry bombs and singular loud “booms” that emit a sharp flash and remind you of scenes from war movies. Or, possibly the real thing. “I feel so bad for older people who lived through the war; they must feel like it’s happening again,” said Barbara, a German rower I talked to at the boathouse a few days after the holiday. I’d had the same thought but was glad to hear a native say it. She’s from Muenster, and she says celebrations in the rest of Germany are not like this; Berliners take the celebration to an extreme. A typical city sidewalk, a good five hours before midnight. To explain: the explosions started the morning of Silvester, though there had been a number of them in the days leading up to it. They started in earnest in the afternoon, and by evening they were unstoppable. My family and I went out for Thai food around 8 p.m. on Kant Strasse near Savigny Platz, and by the time we got to the restaurant the explosions were occurring randomly across the neighborhood and city every second. I know because I tried to count the seconds between the explosions, and I never got past “one.” One down the block, one across the street, one a few blocks away, one around the corner; another further down the street, one in the square… People were crawling the streets lighting explosives across the city as if in orchestrated coordination, reminding me of a Planet Earth episode where the narrator explains that in the rainforest animals time their croaks and squeaks and calls to allow all of the jungle creatures to be heard. It was just like that, each pyromaniac enjoying their full second of glory. These explosions are illegal in much of the U.S. and are rarely heard in the places I tend to be on New Year’s Eve, like St. Paul, Pittsburgh, or eastern PA. In Minnesota you’re not allowed to set off fireworks that leave the ground. Not so here. They left the ground; they exploded overhead, and others just detonated on the ground with a flash and a boom as if someone was trying to blast their way into a building. We had planned to go to the Brandenburg Gate area with the throngs of people for the city’s official fireworks display, their version of Times Square, but by the time dinner was over we were rattled enough by the civilian variety that we all opted to go home. Stepping off the bus at our stop a half block from our building, a firework was actively spraying sparks all over the side of the bus and we hesitated before stepping into its orbit. We crossed the street with two young men; as we walked, one of them reached into his backpack, lit a fuse and threw a sparking firework into the oncoming traffic as we crossed the street. The ground was littered with refuse from spent fireworks already. And the funny thing was, we hadn’t seen anything yet. By 11:45 p.m. we were all sleepy, reading or lying about waiting until midnight so we could wish each other a Happy New Year and go to sleep. One among us longed for something more; “I’m bored!” C kept saying. I consoled her, reminded her we’d played games all afternoon, been out in the city for dinner, experienced Silvester in Berlin, but it wasn’t enough. A few minutes later the neighborhood exploded, it seemed. Those with their own fireworks had clearly stockpiled supplies for midnight, and the dawning of the New Year could not be missed. All of us ran out onto our balcony, and here’s what we saw: a group of people at the turnaround at the end of our street lighting off shooting fireworks, M80s, sparking, colorful bursts. Others closer to the building were firing off rounds towards the building across the street as if they were the enemy. Another cluster of people stood near the tree in the circle of our three-way street setting off their own explosives. More parties could be seen on balconies across the street, holding sparklers and witnessing the fun. And this was just our block; it was happening on every single block of the city, it seemed, judging from the noise and the flashes. In the windows across the street we could see the city’s official colorful fireworks reflected, the large traditional high-in-the-sky fireworks display, but we could not hear them, because the sound of the local ones was too overwhelming. The haze got thicker and the smoke rose and blanketed our second-story air. Some of the fireworks took an errant course and sent their spray rather close to our open balcony, and I made the girls edge back toward the building. The cacophony went on until about 12:30, but we bailed out about 10 minutes before that, driven back by the smoke. I’d seen C’s face lit up with awe at the display, but when we came back in again she resumed her refrain. “C, the city just put on a show for you,” I said. “All you have to do now is go to sleep.” The girl wasn’t tired but there was nothing more I could do for her, so I left her to contemplate her compulsion to be entertained, and laid down to attempt sleep, allowing the remaining explosions to punctuate my dreams. This entry was posted in City life, History and culture and tagged Berlin, Bleigießen, cherry bombs, Dinner for One, fireworks, M80s, New Year's Eve, Silvester on January 7, 2014 by Jill M..
Wild! I had no idea Berlin welcomed the new year with such a bang! It does seem to have a quirky history, and has become popular in a few countries beyond the UK. Funny how these things happen! It’s not just loud in Berlin. 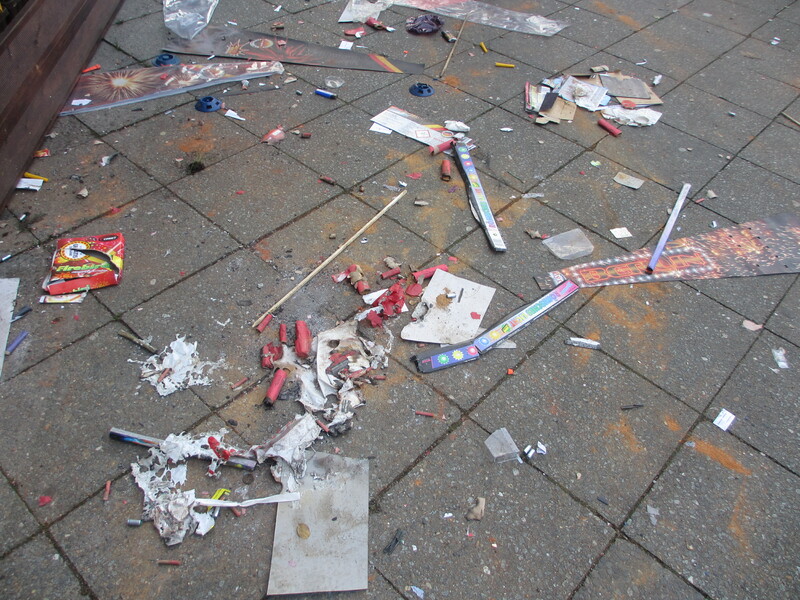 I remember one Silvester in Hamburg where a bottle rocket came very close to hitting me in the head. Crazy!